Gray wolves (Canis lupus) were once found across much of North America, including the Olympic Peninsula. The subspecies that lived here was most likely nubilus. Populations of similar wolves still live in British Columbia. It may not come as news to you. It did not come as news to Buck, Jack London's Arctic sled dog. Certainly not to John Thornton, the man who knew and loved Buck best. Arctic wolf courtesy of NOAA. Dogs are experts at finding chow. Under the snow. In the food box. Frozen. Putrefied. Even fresh from the can, for all we know. Where do dogs get this talent? Jack London thought dogs got their nature from wolves, their closest relative. That's why, at the end of the novel, Buck responded to the "Call of the Wild" by going off to lead a wolf pack. But irony of ironies, wolves apparently can't do something that's second nature to dogs: Use social cues from humans to find the grub. Sure, a wolf can probably smell as well as any tableside beggar, which is to say, supernaturally well. But if you call attention to a blank container, a wolf won't interpret this critical message as "chow's over here, mate." A dog will. Even a puppy raised in the barn can do this as well as your fleabitten beagle long accustomed to praying for a miracle before an empty food bowl. Smack, slurp! How you know? The news comes from research by Brian Hare, a grad student in anthropology at Harvard University. He and his collaborators wanted to know how well dogs could read human social cues. (You read a social cue, for example, when you talk with someone who's constantly eyeing a watch. Without words, you know you've gotta get to the point). Non-human primates, it turns out, are not very adept at reading such cues from humans, and so the conventional wisdom among animal behaviorists was that dogs weren't any better. Hare, however, had both common sense and a pet dog who could practically read his mind. 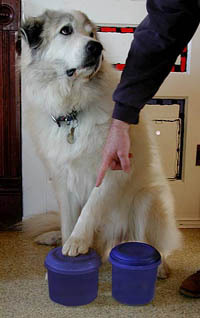 So he set up an experiment to compare dogs, wolves and primates at a simple task: He put food in one of two containers, then called attention to one by looking at it, touching it, or placing a wooden marker on it. The mutts were apparently not using scent, because the containers all smelled of dog-slop. Surprise! Dogs could figure this out, even though the experimenter was a stranger. But wolves and chimpanzees -- our closest relative in the animal world -- were equally poor at reading social cues. No matter what the signal, dogs outdid wolves and chimps. The fact that dogs found the victuals may seem the ultimate yawner, until you consider that puppies raised with little human contact did as well as seasoned beggars, er, canines. "We were very surprised about the puppies," says Hare, noting that the mature dogs lived in families, and that some even took obedience classes. "They were getting tons of exposure to people, and yet there was no difference in their performance" compared to puppies. If dogs and puppies outdid wolves and chimps, how come? "The punch line is that this was not inherited from the last common dog-wolf ancestor, and it does not take tremendous exposure to humans," says Hare. With the two most obvious explanations lying on the scrap heap of history, where did dogs get this innate ability? There are two obvious routes -- both concerning evolutionary changes during domestication. Obviously, dogs that could figure out where master had stashed the provender would thrive in captivity. Reading social cues would allow them to survive and produce more young. But were the dogs chosen ("directly selected") for the ability to understand human social cues? Or was this ability a hitch-hiker ("by-product") that came along with the process of domestication? You can imagine people preferring dogs that could understand human body language, but the alternative hypothesis also has merit. It's already known that domestication changes species in many ways. Domestication generally involves selecting the tamest animals -- for safety's sake, if nothing else. But "if you select against aggression, a suite of changes accompanies the reduction in aggression; there are a lot of unintended changes, byproducts," Hare says. The majority of domesticated animals have floppy ears and smaller cranial capacity, he points out, even though these were not the object of selection. "So it's possible that this ability in dogs is simply a byproduct of domestication," Hare says. "You pick the calmer, more attentive animals, and they are able to pick up these subtle social cues better." Hare hopes to gain insight into this problem by studying the Beyleav silver fox, which was experimentally domesticated in Russia solely by selecting docile young animals. "It's very exciting, it's very infrequent that you know the selective pressure, it's a totally unique opportunity, if we can get the funding," he says, and if the Russians can continue to support the colony of tame fox. The results come as little surprise to Patricia McConnell, an animal behaviorist who teaches the biology and philosophy of human-animal relationships at University of Wisconsin-Madison. "I work daily with humans and dogs, and I'm impressed with how profoundly visual dogs are, and how focused they are on tiny, subtle changes in the movement of their owners." Often, adds McConnell, who just wrote a book on dog behavior, "Dogs are watching us like hawks, but perhaps because we are very focused on words, we often think about what we are saying" while the dogs focus on movement. The new study may represent a welcome return to the scientific study of domestic animals, she says. No less a naturalist than Charles Darwin opened "On the Origin of Species" by recounting changes to sheep during domestication. Since then, however, study of domestic animals has fallen into disrepute because they were considered "polluted through association with people," McConnell says. Ivan, Spot, Maggie and Boomer have all been neglected in favor of more "wild" animals, McConnell says. "There have been more than 1,000 studies of redwing blackbird vocalizations, and under a dozen on domestic dog barks. It may be that familiarity truly breeds contempt." One final note. Won't dog people think the research is obvious? "I had the same reaction," says Hare. "'Of course they do this.' But it's one thing to say that and another to go and demonstrate it. The people who were surprised were the scientists, not the lay people." Buck! The frozen salmon is over there! The Call of the Wild, Jack London, 1903. The Domestication of Social Cognition in Dogs, Brian Hare et al, Science, 22 Nov. 2002. The Other End of the Leash, Patricia McConnell, Ballantine, 2002.